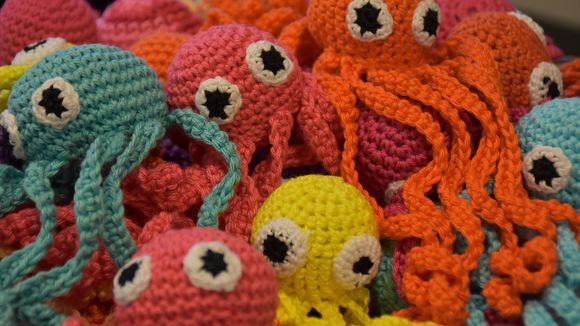 Quote: A crochet octopus boom hit Finland last year, after neo-natal doctors observed that premature babies thrived if they were given the tentacled toys. Now caregivers of dementia patients in Finland say the same toy could help them overcome a recurring problem: preventing people with memory loss from pulling out their drips. .../ Particularly after surgery, patients may have as many as ten different tubes crisscrossing their arms and body, and dementia sufferers who nervously tear them out create hazards not only for themselves, but also the hospital staff. Some of the unit's residents were known to pull out the tubes once every hour or so. "The doctor even gave us permission to bind one patient's hands, so the tubes wouldn't be pulled out. Older patients have very thin veins, so inserting an IV line is very difficult. If connections to the few good veins we can find are severed, we are in trouble. Sometimes we have to install a central catheter instead," says Kuoppala. But the tubes and wires of the Kokkola surgical unit are now left alone, thanks to Kuoppala's crocheted octopuses. Most patients grab a hold of them tightly, handling them repeatedly through the day. "We've had a real drop in tearing out tubes. If I could hazard a guess, it has gone down by up to 80 percent, thanks to the octopuses." Didn't realize ADD was so prevalent in Finland. Now there's a word that doesn't sound anything like it's spelled... and thankfully I think. Umhh...so, how is it pronounced, really? Not sure I've ever heard that word uttered by a native English speaker. (07-30-2017, 05:47 AM)Accidental Stoner Wrote: Umhh...so, how is it pronounced, really? like the bird and the shade of a tree. Spot on. Doesn't sound like crotch at all.